I've been a bit quite this week, my ME/CFS has flared up a little and I just seem to have had one of those weeks. Taking photos of blankets is quite difficult but hopefully that will give you an idea. The stripes are completely random, which actually bothered me as I was doing it. I tend to organise things and doing something randomly like this was strange. But I'm glad I did and I liked the effect once it was finished. 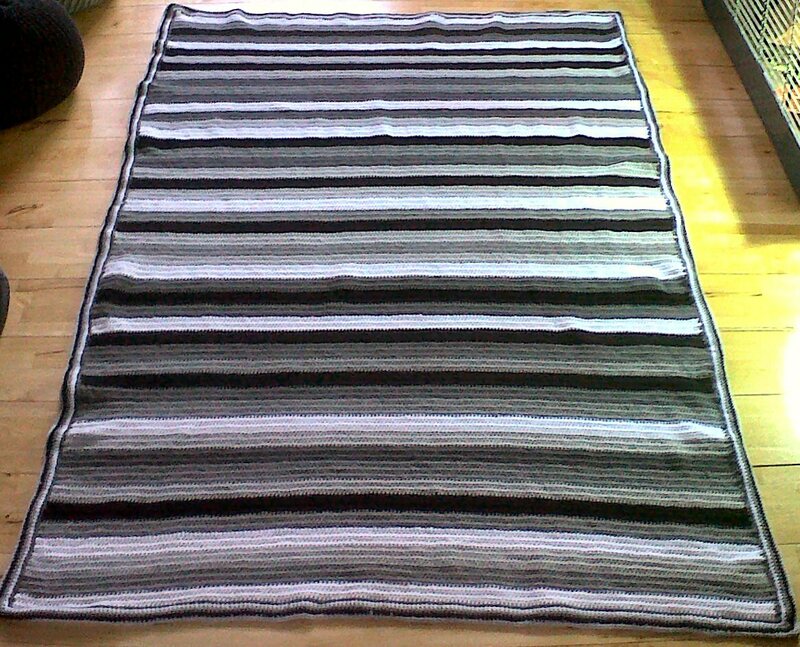 The blanket is 185 stitches wide and the whole thing is double crochet stitch (UK terms) including the border. Its very simple but that was what I was going for. Nice mindless TV crocheting which I could do even when I was tired because I didn't have to think. The yarn is surprisingly nice. Its quite soft, its warm and it was easy to work with. I have definitely found an acrylic I like. I wouldn't necessarily rush to make jumpers out of the stuff, but for a blanket I can sling in the washing machine every once in awhile its perfect. Now I've started on blanket number two which is definitely more colourful than this one. There were times making this one where my brain was convinced the whole world had gone grey scale. It might go with my living room but its a little on the boring side to work with.